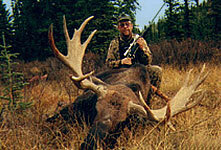 Trophy Hunters Alberta offers rifle moose hunts throughout the corridor west of Calgary and Edmonton. The Rut which is typically the first and second week of October and the Late Season which is in November. We hunt moose using various methods to attract the moose to our hunters. If one method is not working, we can change the plan and/or location as required. Dr. Vaughn Jackson of Colorado, who wanted the 'biggest moose in Alberta", fulfilled his dream with a fine 52" trophy with great mass. Two days into their 6-day hunt, Vaughn, Jeff Washburn, and Norm Kerr had harvested their respective moose. 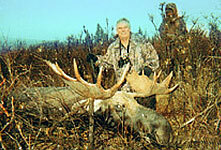 Norm's was a particularly fine trophy with double drop tines on a perfectly symmetrical rack. THA offers moose rut hunts on large tracts of rugged crown land in the western Alberta foothills while our late season moose hunts are conducted in more rural surroundings with a combination of both crown land and fenced ranch land. The rut can produce breathless excitement when a massive bull is in rut and checking out, and aggressively approaching, the source of the calls which they think may be a receptive cow or another bull. We offer remote tent camp moose hunts in the rugged remote foothills area of west-central Alberta in WMU 339 directly west of Edmonton, the last week of September into the first half of October. WMU 339 is a several hundred square kilometer productive moose zone with a one week hunt for only 5 hunters. We utilize 12 x 14 canvas tents that each sleep 2 to 3 hunters. The guides and cook are located separate from the hunters for hunter privacy. The central area is for cooking and eating. Each tent has its own wood stove. We access the area by 4x4 and have available ATVs in camp to help pull out animals. The camp is limited to only 5 hunters and at least 3 guides and a full-time camp cook who is also a licensed guide. We also offer remote tent camp moose hunts west and slightly north of Calgary in the Waiparous and Hunter Valley areas in WMUs 412 and 414 . We offer four spots each year in WMU 412 and two spots each year in WMU 414. Our experienced guides are professional hard working Albertans, who know their respective territory well. We operate these 6-day camps during two consecutive weeks with a maximum of only four hunters per camp including 2 guides and a full-time camp cook. We offer lodge accommodations in the rugged remote foothills area of west-central Alberta in WMU 326 and 429, the last week of September into the first half of October. We typically conduct these hunts annually during the last week of September into the first or second week of October. Trophy Hunters Alberta offers late season big game moose opportunities. Hunt moose on large tracts of private ranch land and some parcels of crown land during the month of November. Moose harvest rates during this month are high, with a number of years resulting in a 100% harvest ratio for our hunters. This time of year is more dependent on the weather. Accommodation ranges from motorhome/ravel trailer type camps, to rugged tent camps, local small town motels to private Alberta full facility working ranches. These hunts are mainly conducted in WMUs 314, 316, 318, 320, 322, 324, 326, 328 & 330. We use a combination of 4x4s, ATVs and a lot of walking, depending on the physical condition of our hunting guests, and the specific requirements of the hunt. We conduct these hunts annually throughout the month of November. During Dale Dixon's hunt, his hunting partner missed a white horned monster that was even larger than Dale's 52 1/2" beauty pictured. When Joe Darst of Texas joined us, on the recommendation of another hunter, he had been hunting since mid-September and had been unsuccessful in his quest for a moose in both Alaska and northern British Columbia. Joe ended up harvesting a real interesting moose with THA with a major drop horn. Prices for our hunts are very competitive. For availability, dates, prices and booking information, please visit Bookings.